These days, you have plenty of options when it comes to cannabis consumption methods. But which is the best for you? Like today’s political climate in the United States, the weed-loving world stands divided on a number of issues. But unlike the corrupted world of US politics, those in support of marijuana still find some common ground. They unite behind their love for Mary Jane. Even so, what may make one person high and happy may make another paranoid and uncomfortable. So what actually divides them is how they get their weed high. Do they prefer the harsh hit of smoke or the thick thud of a high that hits thirty minutes after eating a space cake? Certainly, other methods of getting high off of marijuana are available, but these two reign supreme. And it’s up to the individual how they prefer to dance with Mary Jane. But what sets these two ways of getting stoned apart? 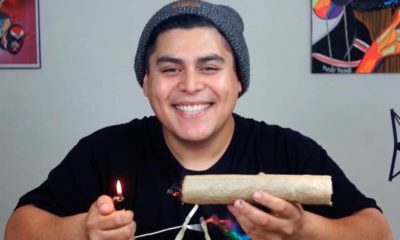 Let’s break down the differences between these sure-fire ways of getting high. When it deciding between edibles vs smoking, what will be the best option for you? Of course, it’s obvious what matters most to some people when choosing between edibles vs smoking. Generally, you want to know “how high will this get me?” And while some mighty tokers and cannabis connoisseurs may enjoy reaching the utmost limits of their high, some want more control. And when it comes to the showdown of smoking vs edibles, the clear winner of what gets you more stoned remains clear. Edibles are stronger than smoking, or at least they may make your body feel that way. When you ingest your weed, half of the THC gets converted into 11-hydroxy-THC. This version of THC serves as a more powerful version and has an easier time getting to the brain. Nonetheless, anyone’s who’s hit a gravity bong might argue in favor of a dense cloud of smoke in getting you high. Sometimes a high can take a turn for the worse. For this reason, many people seek control over their high. Because an edible takes longer to take effect than smoking and because of the length of time it can last for some people, it can sometimes feel too overwhelming. But it’s different with smoking. Taking controlled hits and stopping when the sensation starts allows the consumer more control than with edibles, which can be a deciding factor for some consumers in the debate of edibles vs smoking. It’s no secret anymore that smoking can cause a long list of health issues. Not only does it endanger the lungs, but other parts of the body are put at risk by the act, even the heart. So when it comes down to smoking vs edibles, it’s important to consider the well-being and longevity of one’s health and think twice before smoking that blunt. Furthermore, even states with medical marijuana use regard the method of smoking as risky to a patient’s health. Some states have called for an outright ban by their health departments. But it is important to note it is not the weed causing the health risks in these scenarios. Rather, it is the act of smoking. But if you think that edibles are the simple winner of edibles vs smoking for that reason, beware of an edible hangover. While it’s not lung cancer, it certainly might be a reason to watch how much of that weed brownie you eat at once. But what benefits do either smoking weed or edibles offer, if any? While smoking may never be truly healthy, there are now healthier alternatives the off the sensation of smoking, like vaping. With the options on the market for vaping and its benefits, it might offer a safer alternative for the body than smoking. Still, when deciding between smoking vs edibles, edibles are a safer way to medicate. Further, edibles open up medical marijuana to a wider audience who can benefit from it. A child with epileptic seizures may find an edible a better medication than lighting up a joint. Furthermore, if you make the right edibles, you can fit in your nutrition with your high and get your greens with your green. Of course, in this competition of smoking vs edibles, it is important to consider taste. In this heyday of cannabis culinary and confectionary experimentation, edibles are so varied, offering dank and delicious tastes in candy, salad, or lattes. But in the battle of edibles vs smoking, one cannot forget the simple, subtle taste of bud itself. This experience of tasting the light notes of weed come out best when it is smoked. A particular strain could have delightful citrus notes, like lemon or strawberry. But bad-tasting, harsh flowers loaded into a pipe or out of papers can also be a session-ruiner. So when choosing edibles vs smoking, it helps to start with growing or buying great tasting weed. A true marijuana fan can scoop out the source of a lingering skunky smell like a bloodhound. Unfortunately, usually, people want to hide this aromatic smell. As flowers alone, unsmoked and uncooked, bud stinks. When considering smoking vs edibles, smell has to factor. Making your own edibles can create a stench that might upset roommates or neighbors. And even in places where recreational weed is legal, housing authorities want to crack down on smoking in apartment buildings or in public for the sake of public health. A store-bought edible won’t disturb any neighbors, certainly. But don’t think that its scent won’t entice a drug-sniffing dog if you’re ever around one. Between smoking and edibles, cost may be a determining factor of which to choose. With smoking, the consumer must buy flowers and the method of smoking, such as papers or a pipe. If making your own edibles, not only will you have to call up your provider or access your dispensary, but you might also have to stop at the grocery store to gather all the ingredients (and a cheesecloth!). So, when it put up to picking between smoking vs edibles, the cost ends up being relatively similar. However, if you do buy flowers to smoke or to use in a recipe, rather than pre-made edibles, it may save you money. Like buying the whole pig or cow, parts of a nug might serve well later for making your oil or cannabutter for cooking, like stems. It’s 2018—the ways to consume marijuana just keep expanding. Now, you can drink your marijuana classily, in a wine or you can sip it through a straw in green juice after a work-out. As many types of products that a grocery store might offer on its shelves, a dispensary may offer in the form of edibles. But smoking is not regulated to just a bong or papers. Between smoking vs edibles, pot innovators have created a world of alternatives. But some of these choices can be dangerous, like smoking from plastic or eating too many of those candies. Nonetheless, both the areas of smoking and edibles now offer someone looking for a gift for a weed lover a huge array of options. Today, you don’t have to go far to stumble on a CBD latte. Still many states, some with medical marijuana do not offer the diverse range of edibles that are on the market. Edible fans often must make their own concoctions, especially if they want them to deliver the right amount of THC or CBD appropriate for them. Smoking in some states faces similar regulation. Despite medical marijuana being an option in states like Florida, smoking faced harsh scrutiny. In other states, smokable marijuana came later for medical users. Your geographic location may determine how you fall with edibles vs smoking. Depending on your area, smoking may be a harder method given what is available medically. And if in a state with neither recreational nor a medical program that allows for your treatment? Edibles may not be available to you unless you learn to be a bud-oriented Betty Crocker. Unfortunately, a person cannot just eat raw weed and expect to get high. It’s not that easy if choosing to get high by ingestion. The pot product must first go through the process of decarboxylation. If you do try on your own chef hat and make edibles from your own kitchen, it can expend a lot of energy—and well before you’re even high! For this reason, edibles may require more effort in the battle of edibles vs smoking. So while that high-flying French onion soup may seem like a good idea at the beginning of the process, maybe it may be best to exert your efforts by simply rolling a joint. Smoking weed has always involved a communal culture, one that spontaneously invites others in to enjoy the joy of Mary Jane. Sharing a smoking session can bond a group of buddies. But sometimes, weed consumption requires discretion. Smoking can sometimes be obvious, especially when hot-boxing your car before hitting the drive-thru. Not to mention, smoking isn’t acceptable in certain places, like the workplace, but an edible can keep you going at least half the day at your desk. Even vaping which is arguably healthier than smoking faces prohibition because of over- and misuse in certain areas. In public areas, smoking might even provide others around a contact high. But like making sure not to keep the kids’ Halloween candy in the same place the THC gummies, keeping in mind the social norms of smoking or eating edibles can help you to decide which is best for you in the showdown between smoking vs edibles. Edibles vs Smoking—Who is The Victor? When it comes down to the bottom line, the biggest differing factor when it comes to smoking vs edibles is personal preference. Any of these factors or differences aside, do what works best for you. Certainly, science has proven health risks and benefits for one over the other, but what feels best for your body ultimately comes as your decision. Whatever gets you to the high you enjoy, embrace it. Luckily, we aren’t restricted to the two choices of smoking or eating marijuana. The number of ways to consume and treat with marijuana continues to expand. And after all, we should all be grateful and counting our bud blessings to live in an era with so many options for getting stoned.